Our trip from Tahuata to Ua Pou did not pan out as we thought it would. What we estimated to be about a 12 hour passage took us about 17 hours and we were faced with the choice to heave to till morning or attempt the anchorage at night. Fortunately, the anchorage at Hakahau was pretty well lit up by lights lining the breakwater and all around the little cove. Unfortunately, there was not a lot of space to tuck into behind the breakwater where the best protection from the surge was and the other two boats there had both bow and stern anchors out. We managed to get ourselves situated right between them without too much drama, although the guy from the boat to starboard zoomed over in his dingy to try to help us out right in the middle of it all causing a little confusion. We paid him a visit the next day on our way to shore and it turns out that he, Eric, actually lives in Ua Pou 6 months of the year on his boat with his wife, Marielle, and two small daughters Make and Yaelle. Eric and Marielle are both doctors at the local hospital. They made their way over from France about 3 years back and cruised all over French Polynesia before settling in Ua Pou. 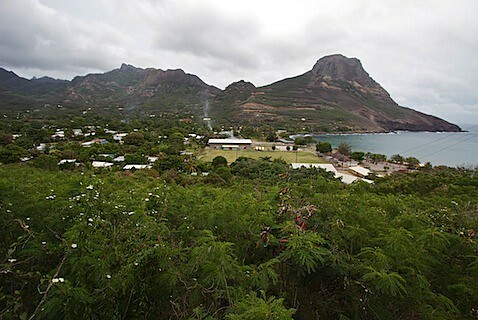 They say that Ua Pou has the nicest people of all the places they've been and that it is their favorite island. Eric also had a very nice tattoo that we asked him about and he informed us that his good friend Kina was the man to see for a tattoo of that quality, thus began our tattoo mission. Eric invited us over to their boat, Le Ouistiti (The Monkey in french? 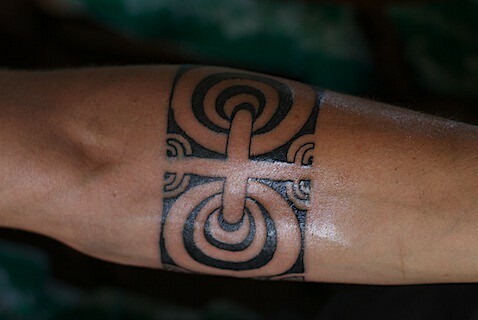 ), that evening and we talked more about how we could go about getting tattoos from Kina. Turns out Kina lives in a village on the other side of the island but he usually comes to Hakahau once a week to see family. Eric was nice enough to call him for us and arrange a meeting. Eric and Marielle were really cool and we learned a lot about the region from them, including the best place to haul out the boat if we decide to do something about the boot stripe and bottom paint before New Zealand. We spent the next couple of days checking out the sleepy little village of Hakahau, working on the boat, and Jared tried out the little surf break in the anchorage. Then on Tuesday we met up with Kina and headed over to his sister's house. Bill and Sue from Dilligaf came along so Bill could get a tattoo and Alex and Ryan from Shalimar came as well to observe and of course, as always, to translate (thanks Alex!). Kina's very pregnant sister, her husband, and her mother gave us a warm welcome and we felt comfortable at once. I volunteered to go first and Alex helped me discuss what it was I wanted with Kina. A man of few words, he sat there nodding and holding his chin looking very serious. You definitely got the sense that he takes his art very seriously and really puts his whole heart and mind into understanding his subject as best he can. 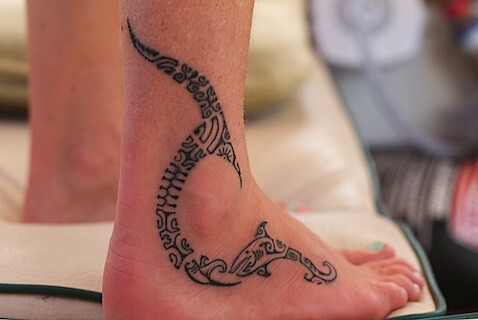 I had decided on the area around my ankle bone and that I wanted a shark, a symbol of the journey there, a symbol of my love for Jared, and a symbol for the family I hope to have in the future. After he did a rough sketch on my ankle and I confirmed that it looked good, he got to work. It definitely hurt a bit more than I thought it would, kind of like I was being cut into with a knife or something. I winced a lot and was breathing pretty hard to get through certain areas, but I didn't cry. It was over within the hour, thank goodness! (I don't know how Jared managed to sit for a total of 20 hours to get his squid tattoo.) The result is a amazing and I am so happy with it. 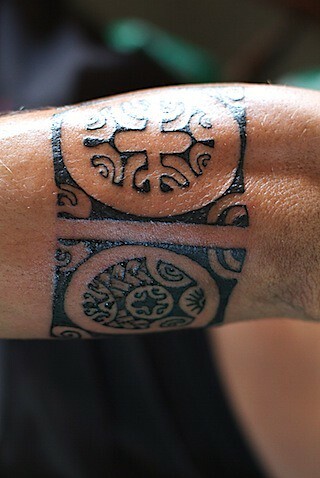 I really love the way some polynesian tattoos accentuate the natural lines of the body and that is exactly what I got. Jared took video of him describing each little detail so we would never forget. Jared was next, and then Bill. They both chose to get bands around their arms below the elbow. Jared's has a special symbol to represent his grandfather and father because of all the invaluable mechanical knowledge that was passed down through them that led to Jared having the necessary skills to do this trip. He also has a symbol of our marriage and one for the journey here. We sat around with Kina's family all morning talking with them and sharing photos (I brought the iphone which has some wedding pics) and information about the island and their lives. They went outside and came back in with bags full of oranges and limes for all three boats. Such generous and friendly people! We were thrilled to once again get an inside look at how people live on these islands and spend some time with them. We can't thank Alex enough for all the translating and Eric for arranging it all for us.